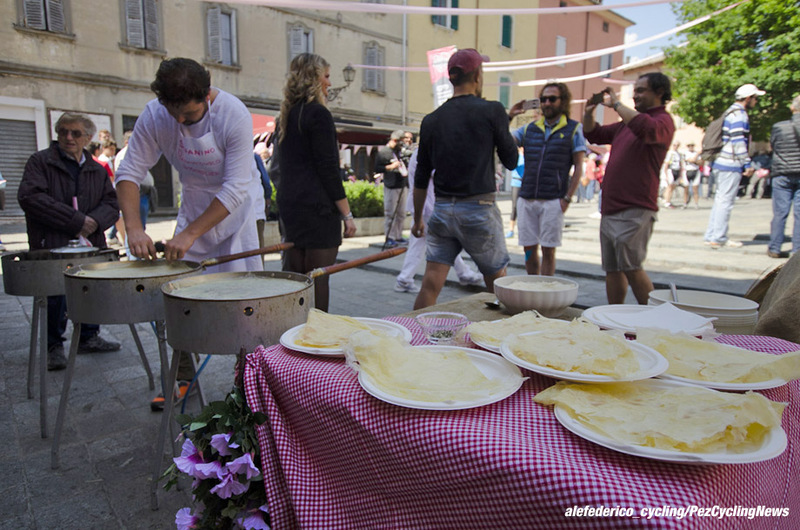 PezCycling News - What's Cool In Road Cycling : Best Of 2016: GIRO Sausages In Sestola! 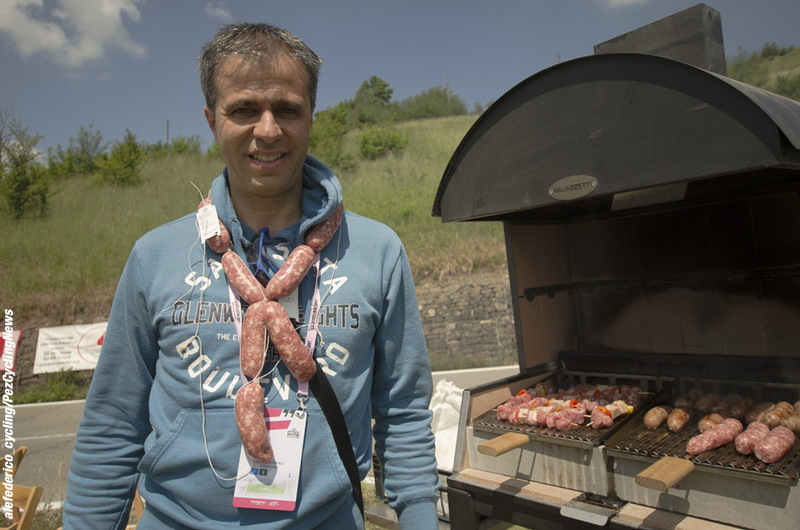 Best Of 2016: GIRO Sausages In Sestola! 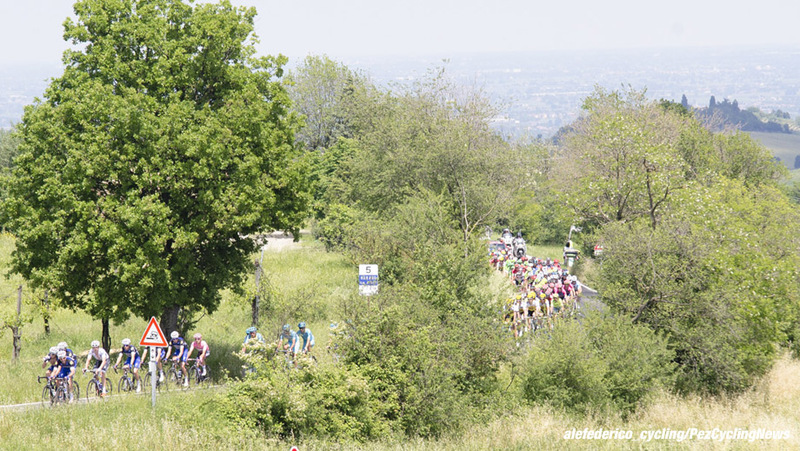 After a deserved rest, today the Giro came to Emilia, crossing the Apennines “Tosco-emiliani” one of the most deserted regions in Italy; full of forests and lonely mountains. The route was coming down into the Panaro valley, heading to Modena (the home of Ferrari, Maranello, was very close), and then back to the Apennines to Sestola, a ski resort not far away from the richest part of the country: Parma, Reggio Emilia, Modena, Bologna. 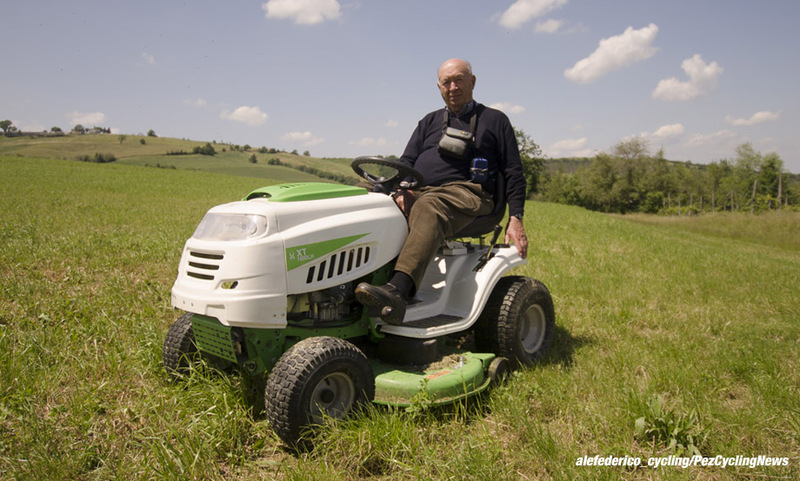 We Italian consider this region the richest because of its standard of life. When they feel in crisis, it usually means the remaining part of the country is bankrupt. 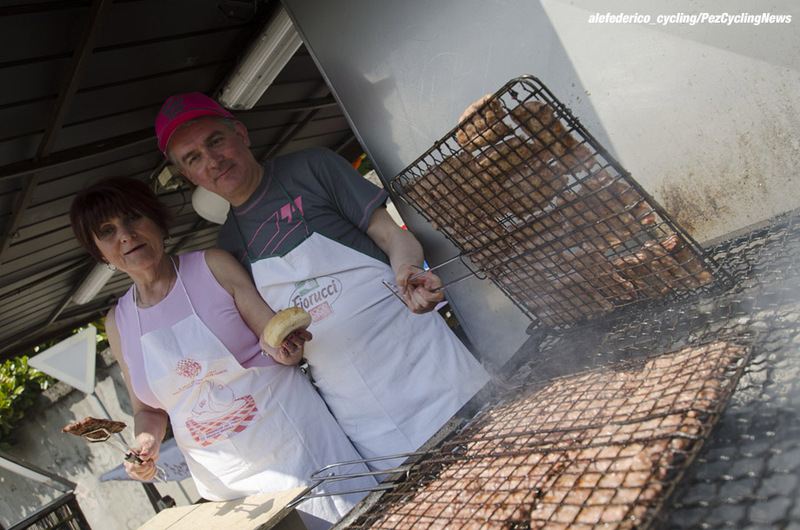 In Emilia everything is gorgeous: food, people and land. Why not enjoy such a place for a day out? Ah, yes, there was also a semi-mountain stage to chase. Studying the map during the rest day I was convinced that one good spot was in the countryside before the two final climbs. 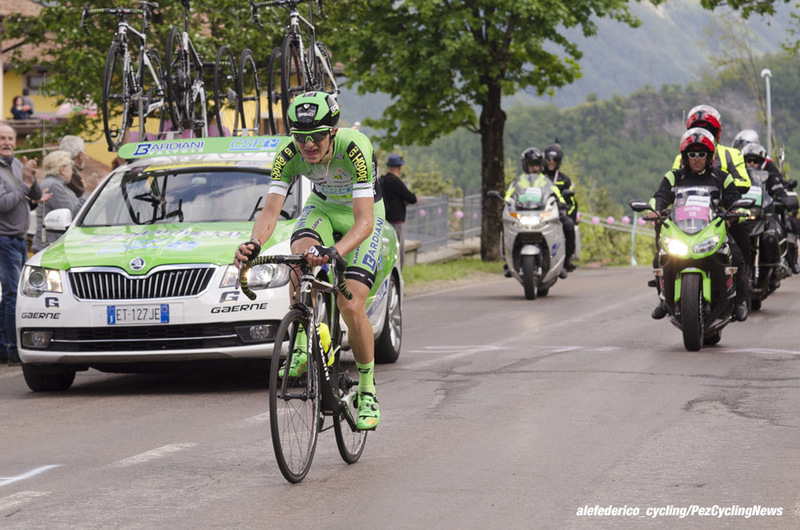 With some luck (and the Giro credentials for the car) I could have easily get also to the finish in time. I choose Marano sul Panaro as my starting point: not far away from the autostrada (exit Modena south), it looked nice to me from the web information. Nothing really special but what’s better than a new place to discover? Unexpectedly, this became the most interesting part of my trip today. This town is built around a small square: a church, the town hall, a bar and a fountain. Well this morning all the citizens where in this square. 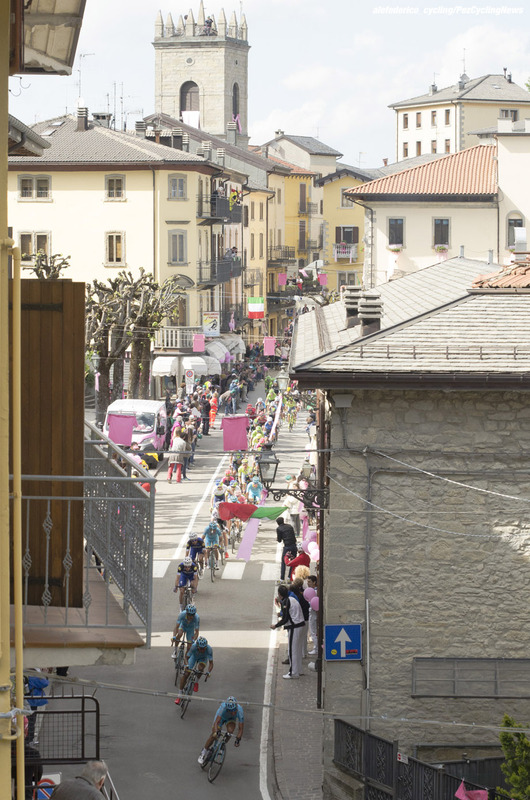 The Giro was passing beside the square in a few hours and this is always a big event for the small town. 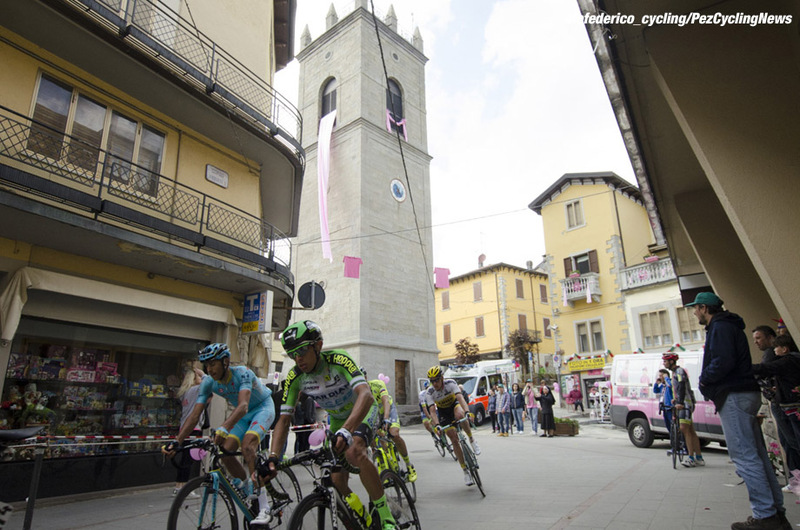 Now, you foreigners believe the Giro is a big event in Italy, and yes it is. But if you go in a big city... nobody cares. 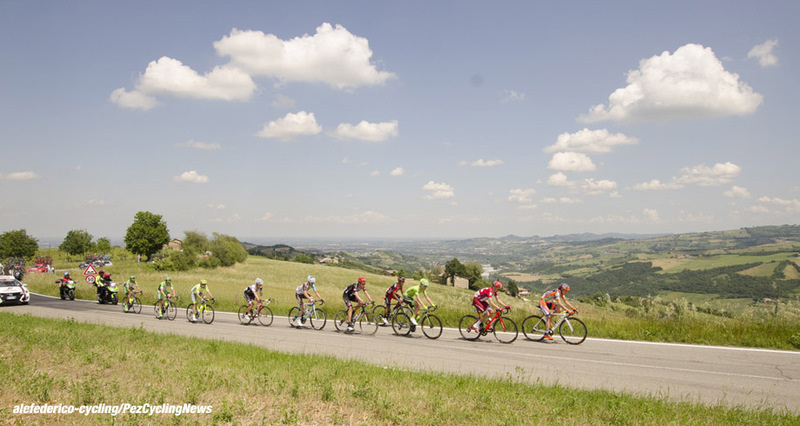 When the Giro comes into Milan or Genova or Rome, it makes just a big confusion and the people start to get nervous and crazy (even more than usual). 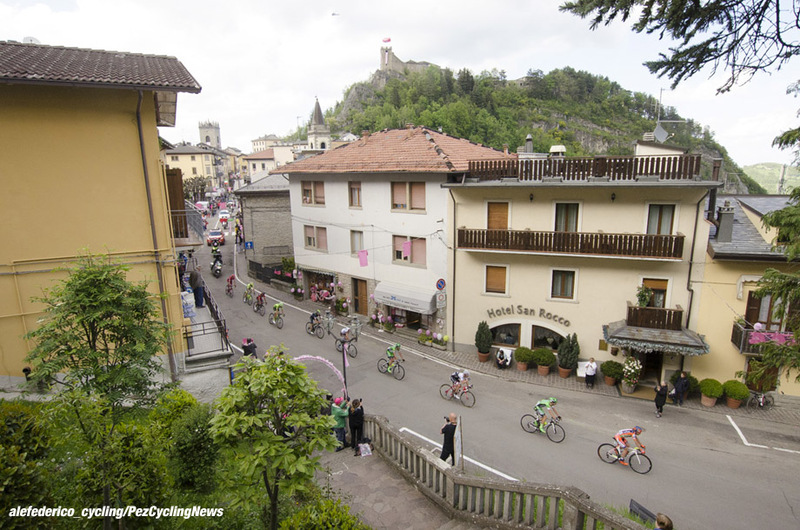 But when the Giro visits the small place it finds it’s most great terrain of growth. We call it “provincia”: it’s the large part of Italy, those medium size, small size towns or even villages that usually stay behind. For one day these places become protagonists and it’s a good reason to show the best they have. Marano did it perfectly. 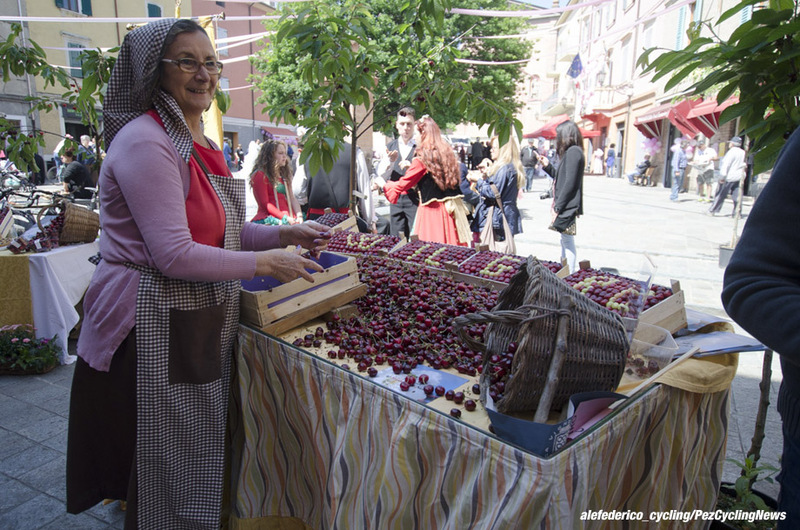 For instance I came to know here they produce the large amounts of Italian cherries. The “durone” quality: the ones which have the skin a bit harder than usual. But the big discovery was the “borlengo”. This is a sort of “primitive white pizza” simply made by a slice of thin pasta topped with a small quantity of cooked pig lard, rosemary and cheese. 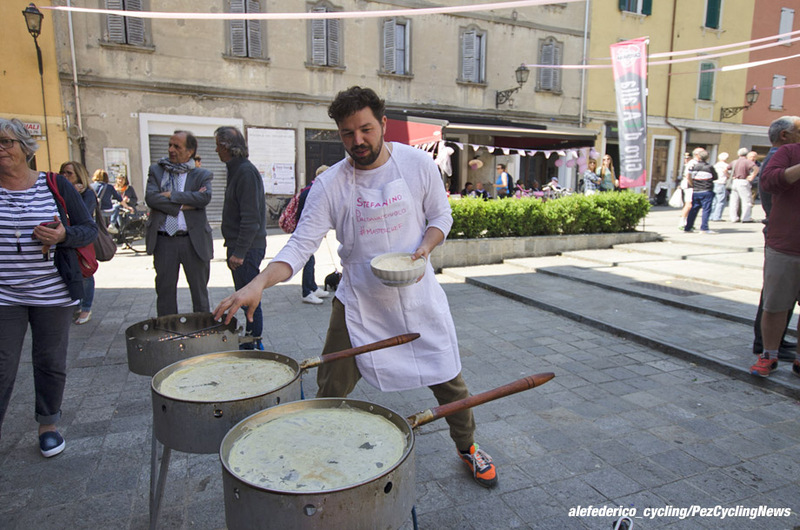 My piece was cooked by Stefano: he is a young man with a passion to cook the borlengo and promote it out of his town. So, Stefano, you got it, your borlengo is on Pez now. Same square, another group was preparing a big fest with their super-salami. This group is the one in Marano dedicated to organize the carnival each year. Not a big event, but the sort of thing that helps these towns to pass the winter alive. They were so nice to offer to me one of their panini that I couldn’t resist (despite the borlengo in my stomach). 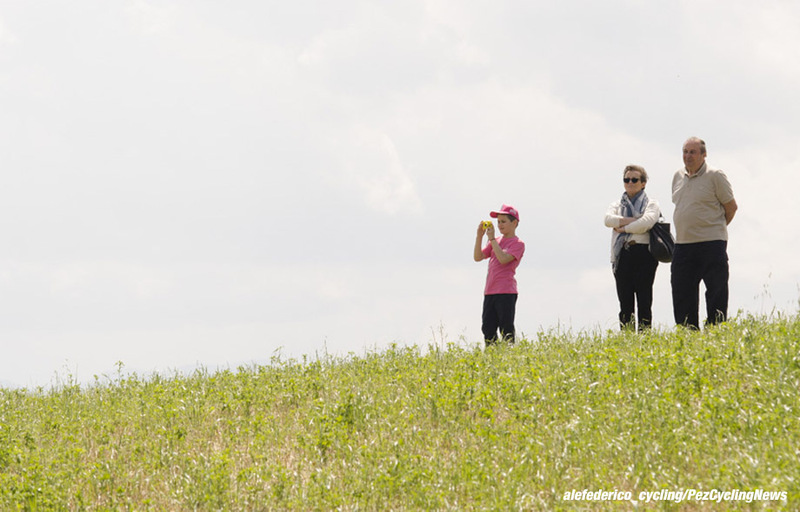 Proceeding on the way to my spot I met a group of other life-enthusiasts having the classic picnic waiting the Giro. They were very well equipped and they were really very nice offering another panini with salami to me. Could I say no? With two panini and one borlengo the plan was to have a sit under a tree on the green grass and wait there till they race was coming. But as I said, this region is to be discovered and I also met two other interesting guys. Ettore and Nello. Ettore was born in Genova (like me) and we had a good time talking about our common birth town and about his new life in Emilia, far from the sea with some nostalgia of it. 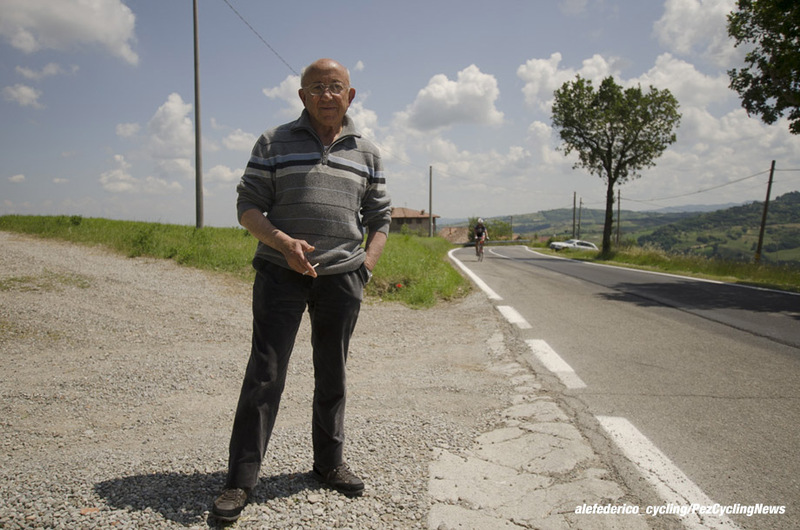 Nello is a retired journalist working in the ‘80s and participating also (as journo) to the 1968 cycling World Championships in Imola. He was interested to my duty and was calling me “colleague”. Well, I explained this is more a passion than a real job, but I must admit I was really proud of his words. What else? Yes, the race. This was a nervous stage that saw Landa’s exit. Unexpected. A group driven by FdJ was already in trouble at more than 100 km to the finish and team Etixx worked all the day to defend the rosa. From Brambilla to Jungels it was, in some way, predictable. Once in Sestola, I was expecting a big battle, especially when I saw Astana accelerating and gaining the head of the selected bunch. But in fact nothing really happened. 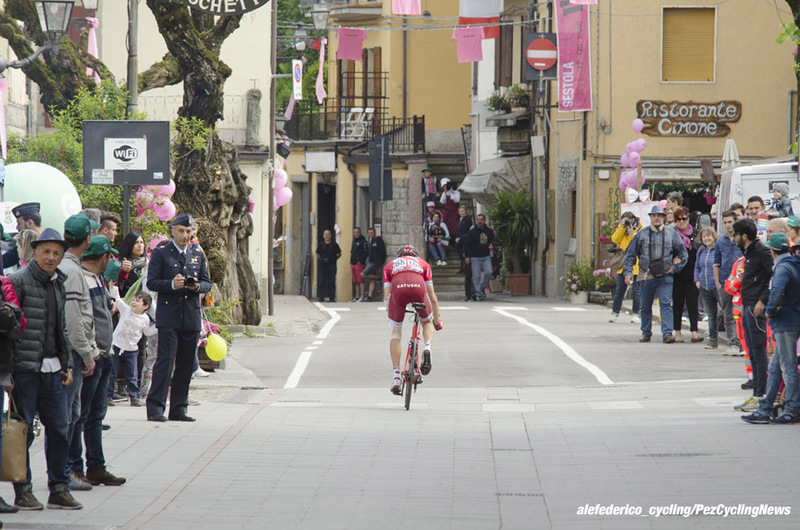 Except for the fact that my personal favorite for this Giro attacked in the descent: Amador. We have to watch him carefully during the next stages. The fact that the “bigs” are watching in the eyes instead of taking the action says to me that there’s nobody really better than the other. Probably Zakarin was but he crashed in the time trial and now is struggling a bit. 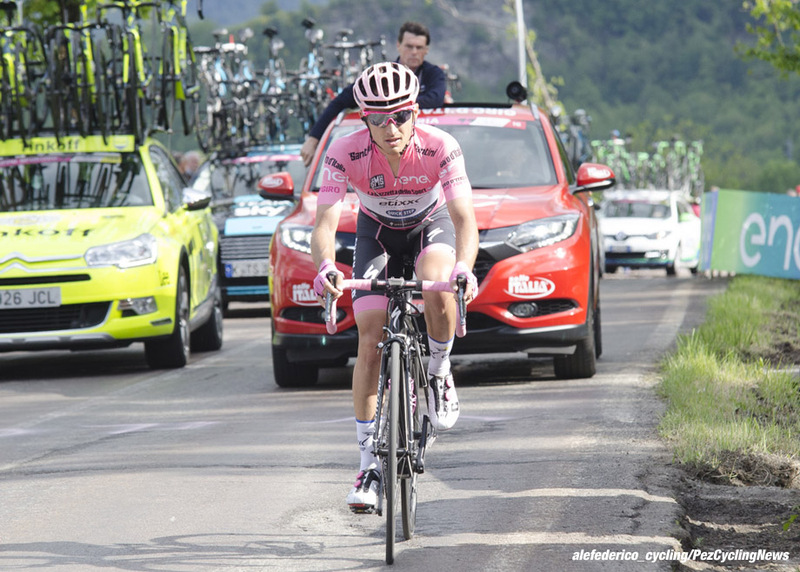 My Giro adventure is over for this year and I will pass the ball to Ed, already warming up in Scotland for an exciting final week. With so many riders packed in few seconds after 10 days of race I think we are going to experience a big finale. 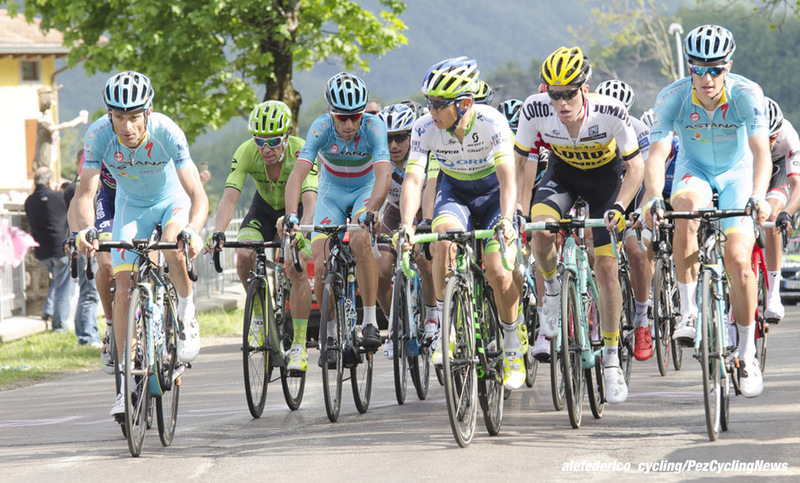 It was exciting, it was fantastic once again to discover something more about my country chasing this bike race. 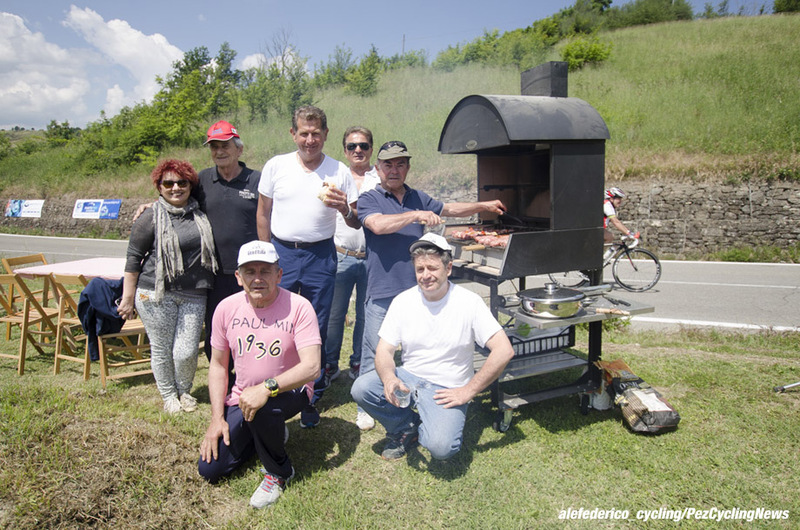 But most important it was great to stop after the race in some bar or pizzeria (as I did today) to try to deliver a piece of the Giro to you. Time to go. Sestola is now empty of the last fans. From the kitchen comes some dish sound. Outside the last light over the mountain. Home calls, and the way is long.